Another wild weekend for Team Magica! Three days of agility (Saturday, Sunday and Monday) and Kipling came home on Sunday night. There's nothing quite like leash 'breaking' and crate training a puppy in a hotel room. We had two SIGNIFICANT puppy fits (one at 7pm and one at 3:30am) - which meant none of us got a lot of sleep last night - but more on that in another post - this post is about Teller-Woo - who ROCKED the house this weekend. Short Summary: Woo went 5 Q's for his 6 runs for double Q numbers 10 and 11 - it's SO nice to be over the half-way point towards MACH. We're chipping away! We blew our Sunday standard run with a weave entry, Teller came out of a tunnel (Tunnel/dog-walk discrimination) and saw the off-course jump not the weaves and by the time I convinced him it wasn't the purple jump he was already past the refusal plane of the weaves. It's "all good" - contacts were great all weekend, our runs were pretty smooth and we left with about 60 points for the weekend - Including an 11 point JWW run on Sunday. Our judge this weekend was Victoria MacVicor - who had fantastic and FUN courses all weekend. I'd never shown under her before but she's definitely on my list to show under again if she's ever judging quasi-local. I was especially pleased that Kipling came 'home' on Sunday night and Teller didn't give it another thought. He watched as his peeps fawned over Kipling - but came out both runs with the same "let's go play" attitude. They're both good boys. 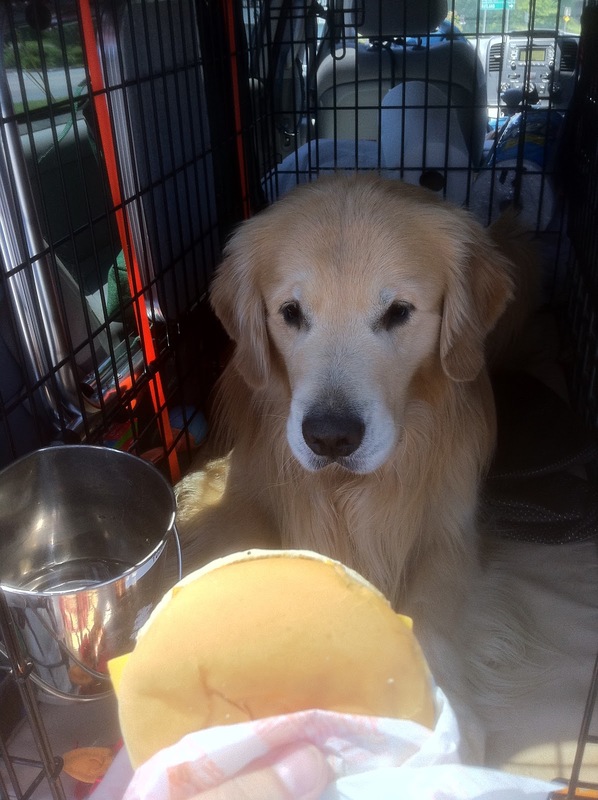 Not to leave Murphy out, Murphy got to share in the QQ cheeseburgers and helped work the crowd for free cookies.